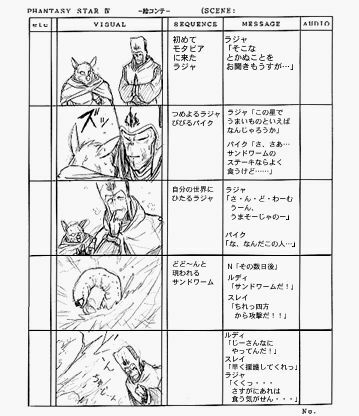 This sheet of unused storyboards shows us what might have happened when Gryz and Raja finally met during Phantasy Star IV. One can only imagine what lines the jokester Dezorian might have dropped on meeting his first native Motavian. It would seem that the sequence occurs in the desert wilderness, given the appearance of what looks like a sandworm near the bottom. Gryz disappears after that panel. Raja's expression in the final panel makes me wonder... did Gryz just get eaten by a sandworm?